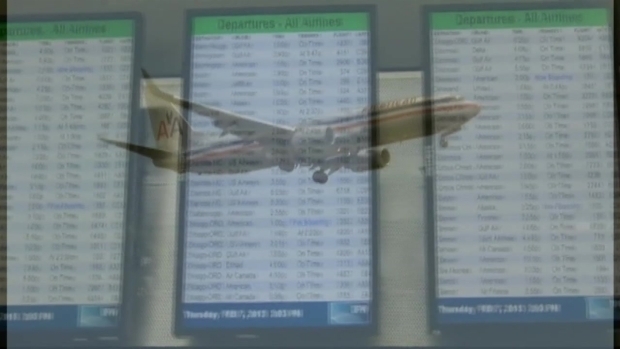 Tensions ran high at O'Hare International Airport Tuesday evening after a day of cancellations and delays due to a fire left numerous frustrated passengers trying to get to their destinations. Inbound and outbound flights slowly began resuming at about 4 p.m. at both O'Hare and Midway after smoke inside a Federal Aviation Administration building in Elgin halted planes earlier in the day. Chicago Terminal Radar Approach Control, a radar facility on Bowes Road, was evacuated of all personnel at about 11:30 a.m. after smoke was seen coming from a vent shaft inside the building, Elgin police Cmdr. Dan O'Shea said. More than 1,120 flights were canceled between the two Chicago airports, according to the Chicago Department of Aviation. Combined with delays caused by Monday night's severe weather, passengers were left playing planes, trains and automobiles. More than 1,120 flights canceled after fire sends smoke into a regional radar facility's control room. NBC 5's Regina Waldroup reports. Carlee and Ryan Haschman of Rochester, NY, were returning home from a Las Vegas vacation when their flight was diverted from O'Hare to Milwaukee Monday night because of the weather. After spending the night in Milwaukee, Tuesday morning's connecting flight to Chicago was canceled because of the fire, so they rented a car and drove to Chicago to catch a 9 p.m. flight -- which was also canceled. They're hoping to make it out Wednesday at noon. Haley Taft was trying to get to Los Angeles for a job interview, and was still hoping to get there sometime Tuesday night. "I might call them and tell them that there has been a fire and hopefully they can postpone my interview, because this is totally out of my control," Taft said. Most area hotels are also maxed out because of the stranded passengers. As for the fire, Elgin Fire Capt. Anthony Bialek said it originated in a ceiling bathroom exhaust fan that overheated. There were no flames but a lot of smoke, and it took crews about an hour to find the source. After the initial fire, flight operations were transferred to the Chicago Center in Aurora, the FAA's Tony Molinaro said. That facility, however, is not equipped to handle the level of traffic the Elgin TRACON manages, so it could not assume full normal operations. Some of the TRACON controllers drove to the Aurora facility to assist. NBC 5's Phil Rogers looks at how the Tracon facility handles approach and departures at Chicago's airports, and why Tuesday's fire shut operations down. Responding firefighters blamed the smoke on a faulty motor in the building's HVAC system. Elgin fire officials allowed aviation supervisors back into the building just before 1 p.m. after the building was deemed safe.